For one night only, the Bacchinalian Society is opening the doors of their Tesla Cocktail Club to the public and mixing up the finest Bloodore elixirs Ohio has ever seen. Join us Thursday Night at 8 pm in the Crown Hotel Bar for a Steam-Age Salon. There, Industrial Dream Mills will officially launch its American Steampunk role-playing game entitled “Steamfortress Victory”. There will be demos of the game hosted by the D20 Girls Project, a Character Creation Costume Contest, and a themed drink menu. So, put on your best Victorian attire and come out for a drink or two. Waltham, also known as the Watch City, “Birthplace of the American Industrial Revolution,” and “a place where I’ve lived” is getting a steampunk makeover. Indeed, the whole town! From May 6-8, Waltham will play host to the International Steampunk City festival, which will serve as an ambitious city-wide fundraiser for the Charles River Museum of Industry. Scheduled events include special offers at local restaurants (there are quite a few), steampunk cinema screenings at the Embassy Theater off the locally famous Moody Street, and steamy performances that will no doubt be conducted in the city’s lush public park. I have come up with something that might be crazy or might be wonderful fun. If you are game then speak up , come forward and lets have some good friendly sport. Proper attire is, naturally, expected. Cyclists should put aside their luminous blue all-in-ones and their fancy alien-shaped helmets, and favour instead a full tweed suit with plus fours, an eight-sectioned cap, Tootal scarf and a stout pair of brogues. Ladies can wear tweed skirts and thick stockings, as long as their bicycle is adequately secured against oil leakage. The organizers expect 400 or so cyclists to participate, and onlookers are welcome. No comment has been thus far made as to whether gentlemen may carry their Ray Guns, nor ladies their Æther Disruptors. “Hot off the back of the Second-Ever SteamPunk Magazine Steampunk Soiree in December last year, the folks over at SteamPunk Magazine are organising another knees-up. This time the party is taking place at the Little Marlborough Theatre in Brighton on the 19th and 20th June. Someone suggested the name ‘The SteamPunk Magazine Seaside Spectacular’, and now there’s no stopping them. With prizes for the best steampunk seaside costume, an art and photography competition on the theme of ‘What the Butler Saw’, music, burlesque, market stalls, dance lessons and a variety performance spread across the entire weekend, SteamPunk Magazine have decided that they do like to be beside the seaside, and would like very much for you to join them. Due to a limited amount of space at the venue, there are only 150 tickets available for this event, so if you’re interested then you had better get there fast! 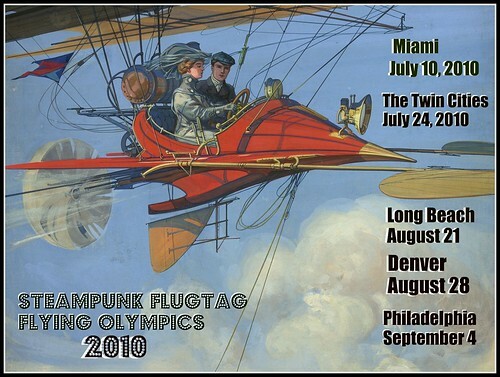 Tickets and more information are available on the SteamPunk Magazine website ,or via their Facebook site for the event. A Steampunk Cruise on Sydney Harbour. From Patrick Twyford (aka Wilham de Gray, a boilermaker of the Imperial Engineering Corp.) comes this set of pictures taken on December 19.. The Forrester Gallery in Historic Oamaru Victorian Town will be hosting an art exhibition “Steampunk @ The Forrester” , which opens on 7 November and runs through to 6 December. Admission is free. Weta is dispatching the range of Dr Grordbort’s finest rayguns and artworks to the Forrester Gallery, where they will join forces with collections from New Zealand’s finest steampunk artists. This exhibit is in conjunction with the Oamaru Victorian Heritage Celebration , which includes such events as Penny Farthing Races, a street parade, a Grand Ball, and a Victorian Street Market..